Being that we are traveling for a full year, our chances of one bad thing happening would seem to be pretty high. A two week vacation has common enough problems like losing luggage at the airport, or arguably worse, losing a few days to food poisoning. We are hoping the late night kidney stone emergency is our one really bad thing, and the rest of the trip moves smoothly. 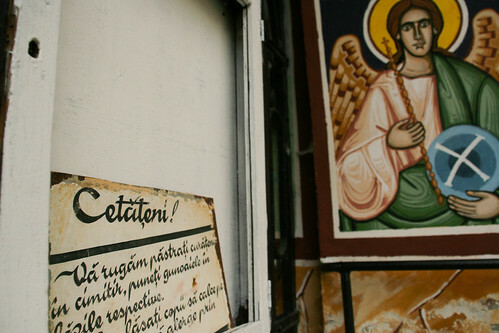 Sadly, this does mean our time in Romania was a little different than planned. 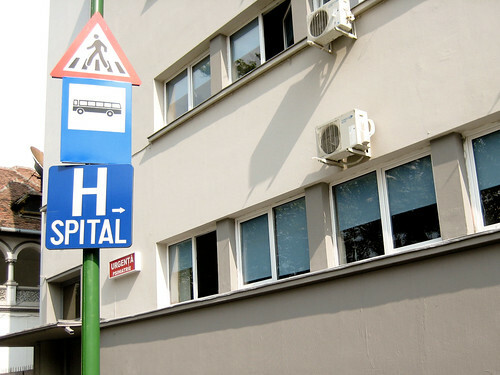 Brasov is an abundant little city — one which luckily has a very friendly, semi-English speaking hospital. After freaking out the hostel staff at 3 in the morning by writhing around on their front steps, they helped us with an ambulance. 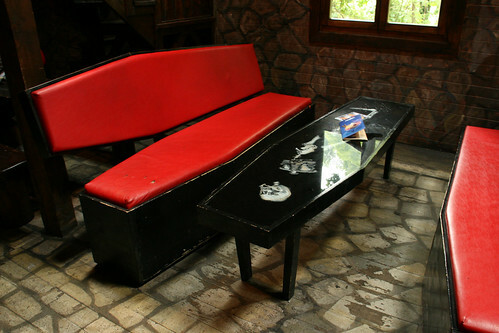 We found out that Romania does not believe in narcotic painkillers. Jeremy was loaded up with muscle relaxers and we waited for stones to pass. Note to all would-be sickies in Romania: our emergency medical services, including ambulance ride, was completely FREE. Hurray for socialism. 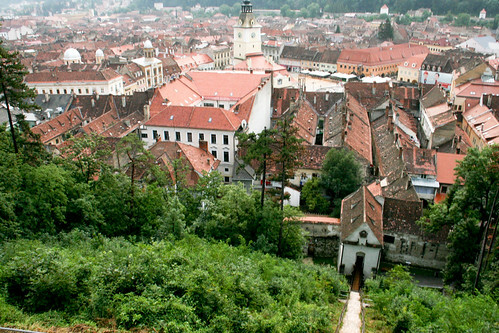 The old core of Brasov is quaint and sweet, the surrounding hills picturesque in their lush greenery. There were the typical village details: ruins of fortress walls, massive churches and fortification towers, all well maintained and enjoyable to explore. 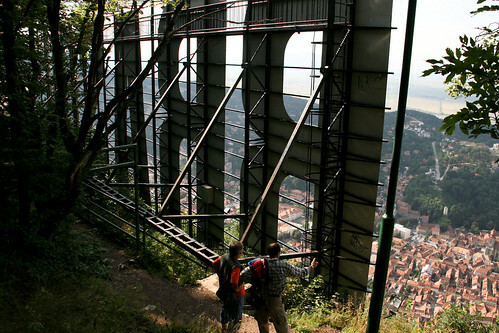 To keep in step with the changing times, Brasov has also installed a massive two-story white “BRASOV” sign on the mountain over the city á la Hollywood. 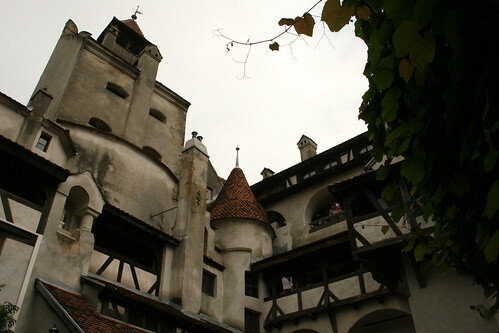 Despite the medical emergency, we were able to make a quick day trip to nearby Bran Castle, a huge tourist locale. 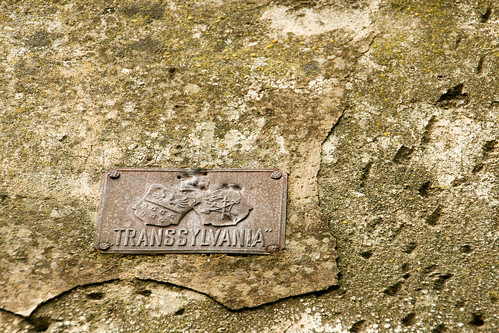 Since this is Transylvania, the city of Bran is packed with vampire paraphernalia and little else. 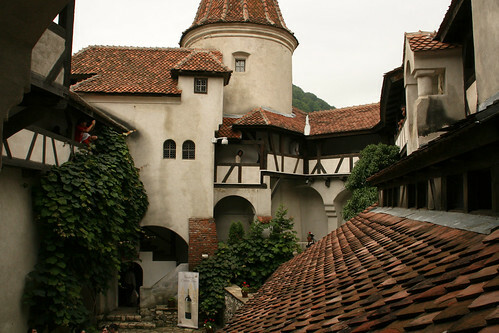 However, infamous Vlad the Impaler has nothing to do with the castle, or city. Once you get inside the grounds, the castle is enjoyable for its own architecture and ambience. 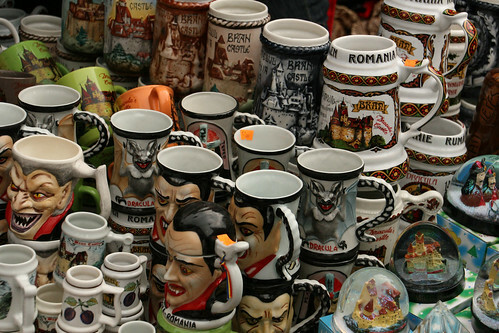 In the end, it’s really sad what we missed out on in Romania. This is a beautiful country with lush green hills made for hiking and camping. It’s also a country that hasn’t yet become easily accessible for the traveler. Trains and maxi-taxis (private, insanely driven buses that make cheap travel frightening) don’t quite cover enough ground, making places like the Bicaz Gorges difficult to get to. We’ll be coming back to Romania, but next time we’re renting a car, drinking lots of water and packing plenty of painkillers. Oh no! I am so sorry to hear that – Jeremy, hope you are feeling better now..no painkillers?! yikes. The city looks really pretty, thanks for the tip that it’s not so doable via public transport, good to know! Oh no! I hope Jeremy is feeling better. It was a beautiful city. 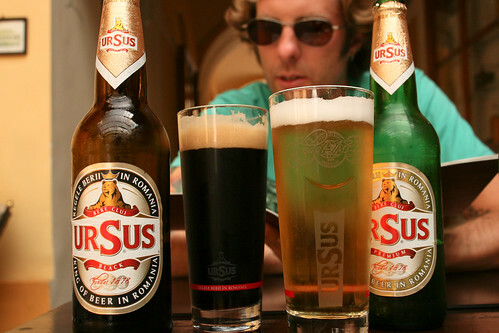 Hopefully, muscle relaxers + Romanian beers was close to a pain killer. We’re glad everything is okay now. 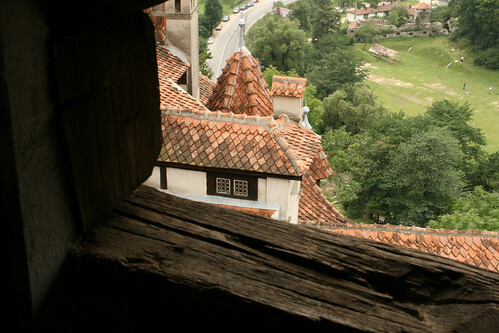 Romania looks incredible! Aye Jeremy, let that indeed be the worst. Travel safe guys. Enjoying the blog. wondered and hoped this wouldn’t happen to you Jeremy. Glad you’re ok now. I can picture you “writhing on the step”. Take care! Hi there, I have just found your “travel blog” today. I am impressed on how much you are traveling. I think is great that you have this opportunity and the time to see the world. 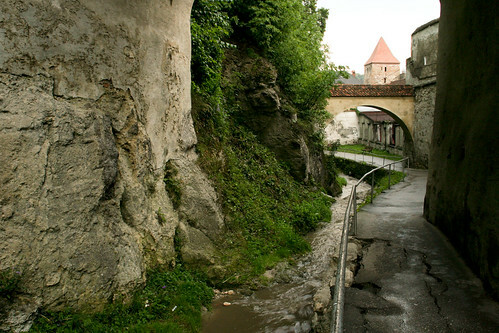 I am from Romania and like you I know it is a bit difficult to travel around when you don’t have a guide. But I do believe that this is actually why Romania still is a wild place. We have a incredible vibe in my country and is due to bad truism marketing but if you know where to go you will find it amazing. As for the hospital staff I know they seem a bit unprofessional. I currently live in Denmark and I have no idea yet when I’ll be going back for a visit. It would be great tho to keep in touch. It is nice to meet new great people such as you two.